Until recently I hadn’t understood how generous the Seed Enterprise Investment Scheme is for investors in early-stage companies. 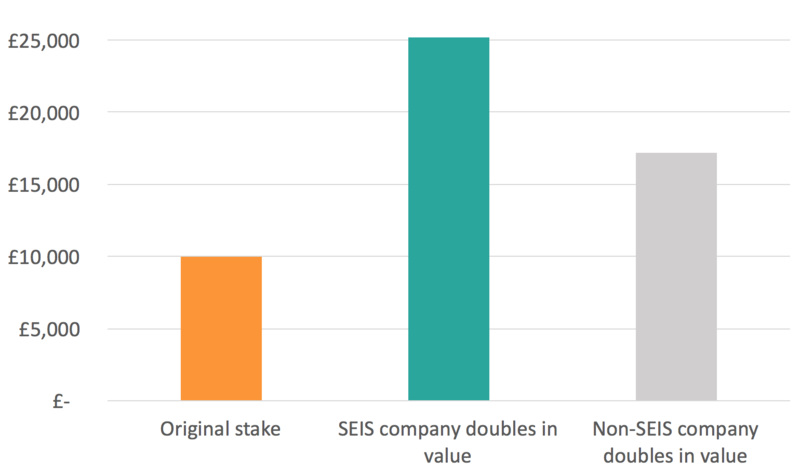 Investors can put up to £100k in qualifying companies, as long as they don’t control more than 30% of the SEIS company. There are three overlapping benefits which mean you can recoup over 100% of your investment in tax offset if the companies goes bust, and get a 5x boost to the value of your initial investment if all goes well. It sounds too good to be true, so use your allowance while it is still open! Let’s assume that you are an additional rate (45%) tax payer, and want to invest £10,000 of capital gains into an SEIS company. What happens if that company eventually goes bust? Next you can write 50% of your £10k investment off against your income tax bill from this year or last – even if you didn’t directly use that income to invest in the SEIS company. If the company goes bust, then you can write a further 45% (your marginal tax rate) in the year you claim against your income tax bill. 45% times the £5,000 of investment the tax payer didn’t originally fund. So of that £10k you have already recouped £2,800 + £5,000 + £2,250 = £10,050 from HMRC. Leaving you with a small gain to cover the inconvenience. But look on the bright side! What if the company sells for double the value in a few years’ time? So you get more than five times the net gain from the SEIS investment.